We only rent new and well maintained machines so you will always be happy with our equipment rentals. 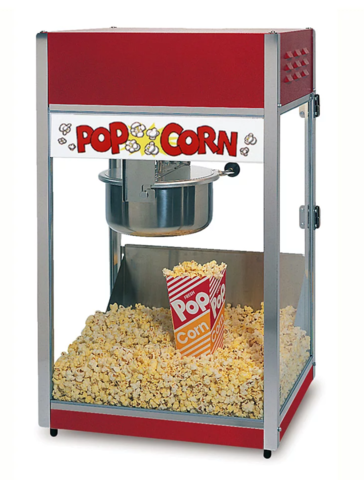 Our commercial popcorn machines will produce approximately 160 quarts of popped corn per hour. Each popping cycle runs about 3 to 3.5 minutes which means you can have a delicious snack almost immediately. THIS ELECTRONIC EQUIPTMENT MUST BE COVERED AT ALL TIMES UNDER TENT OR PLASTIC BAG TO PROTECT FROM WATER DAMAGE. SEE CONTACT OR F&Q PAGE FOR COMPANY POLICIES.